Fine china manufacturers N-Z (alphabetical listings). This is page 3 of 3 of Peter Holland's "Who's Who" of famous china makers within Western culture. The story of the entrepreneurs who founded companies, and how they left their mark. Includes a short synopsis of each maker - or a link to their individual page. Does not include every maker that ever existed. We investigate the stories of the lesser known makers in our 'china chat' section. Founded in 1747, Nymphenburg moved from Munich, to a purpose-built factory in the grounds of the castle of Nymphenburg in 1761, where it is still in operation today. Nymphenburg are associated with master sculptor F.A. Bustelli, whose distinctive series of figures at the end of the 18th century, command the highest prices. Reproductions are still made today. Known by collectors particularly for their wild life and dog figures made in the 20thCentury. See also Dresden China (Listed under 'D'). Palissy Works, Chancery Lane, Longton, Stoke-on-Trent, Staffordshire, UK. Not to be confused with Palissy ware produced by Minton. There is no connection - Palissy ware was the name of Minton's relief decorated colour-glazed earthenwares. Both the Palissy works in Longton, and Minton's relief ware were named after a famous French pioneer of 16th Century relief-moulded wares called Bernard Palissy (a protestant who died in the Bastille). The UK Staffordshire Palissy Pottery works were founded at sometime in the mid 19th Century by the Grove family (Richard H. Grove). Records are unclear, but some references mention 1853 as the founding date. By 1898 records show the occupiers of the Palissy potteries were a company called Grove & Co, but this firm continued at the Palissy Potteries only until 1904 when A.E. Jones (known for Grafton ware later ‘Royal Grafton’ fine bone china – see listed under ‘R’ in the antique bone china section) took over the plant. Jones, A.B, & Sons, Ltd. - Albert E. Jones (Longton), Ltd. – makers of Royal Grafton bone china and Palissy Pottery were makers of fine bone china cup and saucers, decorative porcelain, vases, giftware and porcelain figurines. The A E Jones interest lasted until 1946 when the Palissy Works were re-launched as a new concern known as Palissy Pottery Ltd. Royal Worcester bought the brand in 1958. Jones are thought to have used the Palissy Pottery backstamp from about the 1930’s onwards, but the bulk of ‘Palissy Pottery England’ backstamps will date from between 1946 to 1958 and be part of the collections made by Palissy Pottery Ltd. The Royal Worcester Palissy wares from the 1958 to 1989 era are generally clearly marked with a Royal Worcester backstamp. Palissy ware can be either bone china or fine china (stoneware or earthenware). Much of the Royal Worcester production is fine bone china as are the collections of Royal Grafton (A. E. Jones). Neither are old enough to be listed in the antique bone china section, hence the Palissy listing being on this page. 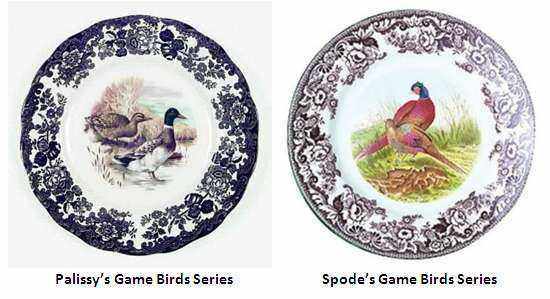 A popular pattern produced by Palissy was called "Game Birds" and is very similar to a pattern produced by Spode called "Woodland". Aynsley China Ltd bought the Palissy trade name in 1989 from Worcester (which had merged with Spode in 1976). Nothing remained of the original plant which was demolished in August of 1989. The original Grove Palissy wares are much rarer and, as the firm went through various incarnations in their 50 odd years of history, are a study in their own right. Find a Richard H. Grove piece of Palissy ware in your local garage sale, and quietly buy it, telling no one! see the Portmeirion Tableware page. 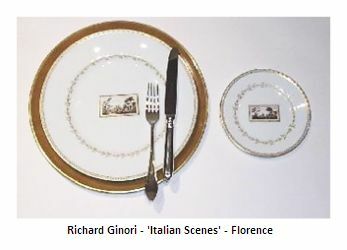 Founded 1753 Florence, Italy by Marquis Carlo Ginori, Richard-Ginori are specialists in hard (feldspathic) porcelain - i.e. hard-paste not bone china. The English Porcelain company Richard Ceramics Company founded in 1873, joined with the Ginori porcelain firm, in business since 1737 to form Richard-Ginori, the premier Italian manufacturer of porcelain today. See the Rosenthal dinnerware page. see Royal Albert Bone China England page. Famous Danish maker, established in 1775 under the patronage Queen Juliane Marie. It was one of the first factories outside of Germany to begin production of porcelain. "Blue Floral", one of the earliest Royal Copenhagen patterns, is still in production today. Most pieces are still painted by hand today. see bone china manufacturers section. Founded 1896 in Staffordshire, England by Arthur Shorter. Clarice Cliff’s association with mass producer A. J. Wilkinson (often branded as Royal Staffordshire C.1910 until the 1930’s) meant that her wares were mainly earthenware. Clarice Cliff had married Colley Shorter, the son of the founder of A. J. Wilkinson in 1940, having worked for the firm for 24 years. 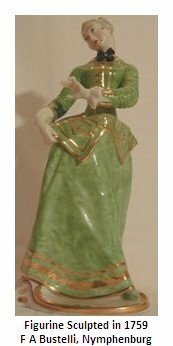 Recently (2006) I was commissioned to sculpt a fine bone china figurine which was made and produced with the Royal Staffordshire back-stamp (now owned by distinguished design firm Compton & Woodhouse). 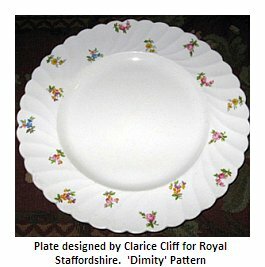 We plan to follow up with more Royal Staffordshire bone china wares. The ‘Royal Staffordshire‘ trade name was also used in the 1960’s by J & G Meakin (a mass producer and exporter of everyday tableware - see under 'M'). The connection was that Meakins merged with Midwinters in 1968 who had, in turn, bought Wilkinsons four years earlier. In 1970 Midwinter/Meakin were taken over by Wedgwood Group, thus making the Claris Cliff brand and patterns their property. For more information on the 'Royal Stanley' backstamp, go to my page on Royal Stanley. Royal Stanley is a backstamp of the Colclough Bone China Company. For more information on Colclough go to antique bone china makers listed under 'C'. Royal Sutherland or Sutherland is a pottery mark of antique bone china manufacturer, Hudson & Middleton see listed in the Antique bone china manufacturers section under "H". 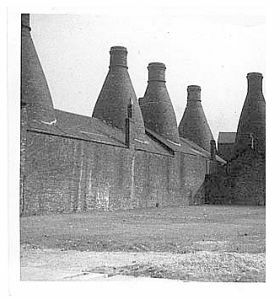 Also known as Foley Pottery, Shelley Potteries began as Wileman & Co in 1862. Joseph Ball Shelley partnered with the firm of Henry Wileman at the Foley China Works, Fenton, Staffordshire. Over the years they worked with important designers including Mabel Lucie Atwell. This may explain the inherent and perennial popularity of Shelley wares with collectors today. Shelley continued in production until 1966. The name is now owned by the Doulton Group. 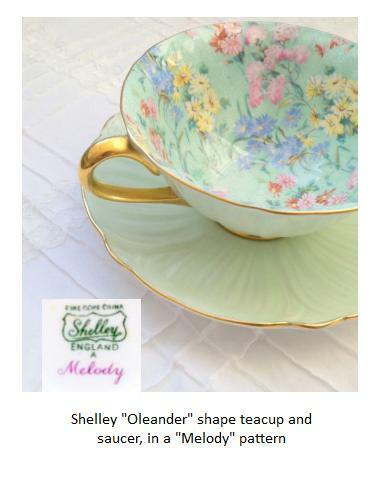 For more detailed information, please visit this excellent Shelley/Wileman collectors site - www.shelleyclub.com. The Sevres porcelain factory was established in 1756 under the Royal Patronage and management of French King Louis XV. Previously, in 1738, skilled pottery workers from the ceramic center of Chantilly had been moved to the Chateau de Vincennes and from there, moved again to Sevres in 1756. The town of Sevres is a town or suburb to the South West of Paris and was used as the decorating center for porcelain blanks which were manufactured in the town of Limoges 200 miles to the south (the source of the all important "missing link" raw material known as kaolin, china clay or feldspar - a hydrous aluminium silicate, Al4Si4O10(OH)8). Early in-tact Sevres Porcelain (soft-paste) is very hard to find due to its fragility. 1756 saw Sevres become the new center, conveniently located near the King's Palace at Versailles and the home of his mistress, Madame de Pompadour. By 1769 Sèvres had learned the secrets of hard-paste and had begun to make real Chinese type vitreous porcelain. The king's aim was always to out-do the German (Saxon) makers. However, it was lucky he took such an interest because the factory was always in a bad way financially. Excellence was the King's main concern, not profitability. To aid the his beloved porcelain factory the King then granted a state monopoly for porcelain manufacture. Sevres porcelain then began to overtake Meissen. Meissen of Saxony (now Germany), the originators of Chinese style porcelain in Europe (see under "M" and also "D" for Dresden) were the first to emulate the Chinese secrets of hard-paste porcelain and dominated the style of European porcelain manufactured until the mid-1700’s, for further information see porcelain china section. Meissen had never enjoyed the privilege of a state monopoly in Germany. So it was in the mid to the latter part of the 18th Century, prominence in European porcelain manufacture passed to the French in Sèvres. However, all this acclaim came crashing down with the French revolution in the 1790's. However 1804 saw a new state 'manager' and under the Patronage of Napoleon, Sevres porcelain entered a golden era for 40 years of success. Key to that success was (at last) the addition of a profitable mid-priced market appealing to the emerging bourgeoisie nouveau riche. Sutherland or 'Royal Sutherland' is a pottery mark of antique bone china manufacturer, Hudson and Middleton - see listed in the Antique bone china manufacturers section under "H". Volkstedt, founded in 1762, is the oldest of the Dresden factories and makes a large range of traditional figures. 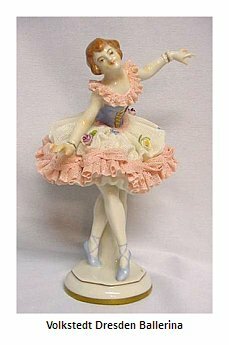 More recently it has been involved in the reissuing of the works created by artists at the beginning of the 20th century in plain white porcelain. The Volkstedt ‘Swarzburger Werkstatten’ group was a collective of sculptors who started working together in l908. About 120 artists were involved in this studio over the next thirty years, many of whom went on to work for Meissen, Berlin K.P.M. and Hutschenreuther. see Wedgwood section see the Wedgwood section. Weesp was the first successful hard-paste Dutch porcelain factory. It was founded by Count Gronsfeldt-Diepenbroek in 1759. Wilkinson was the firm whose pottery mark was 'Royal Staffordshire' (see under 'R' listing) and for whom Clarice Cliff worked and eventually fronted up the 'Claris Cliff' pottery mark - see "C" for Clarice Cliff .